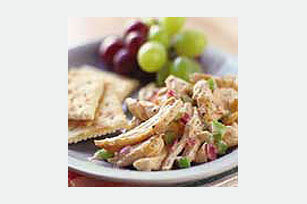 Try a Spicy Chicken Salad for a little extra attitude. This Spicy Chicken Salad has chili powder and cayenne pepper, plush a dash of cinnamon, too. Toss chicken, celery and onions in large bowl. Mix next 5 ingredients until blended. Add to chicken mixture; mix lightly. Refrigerate several hours or until chilled. Serve each portion with 1 cup grapes and 5 crackers. Never allow cooked chicken to set at room temperature for more than 2 hours. If the cooked chicken is not eaten immediately, it should be kept hot or refrigerated. Serve spooned over a bed of chopped lettuce or as a filling for sandwiches. Add 1 cup chopped PLANTERS Pecans to chicken mixture just before serving.